Thursday was our first full day. We began with a walk through the Old City of Jerusalem. There, we immersed ourselves within Israeli culture using all of the senses. We heard the shofar blasts, church bells and the Muslim call to prayer. We enjoyed our first tastes of falafel, schwarma, and hummus. Then we went to the City of David, where we literally got our feet wet, walking through Hezekiah’s Tunnel, an ancient aqueduct. In the afternoon, we visited the Western Wall, which was a meaningful experience for the group and filled with many prayers of the heart. The night ended with the engaging speaker, Neil Lazarus, who taught about the realities of the current state of Israel versus what the media portrays. Friday, we spent the day at Neot Kedumim Biblical Park where we learned about leadership and teamwork through nature. BBYO participants imitated Moses and acted as shepherds, herding goats and sheep by foot. They also took part in a tree planting ceremony through Jewish National Fund. 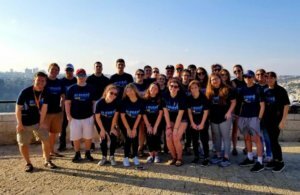 As we entered Shabbat, relationships with the land of Israel had already begun to take root, and we are all excited to see how they blossom over the next two weeks! PS- To see photos from the trip, click here! Also, please note that the Facebook group is for the teens and staff only. Next: Exciting adventures in Tzfat, Galilee, Golan Heights, etc!